10ft Trampolines & 10ft Trampoline Packages. Free Next Day Delivery! If you are looking to buy a 10ft Trampoline, Atlantic Trampolines have a range of packages available, all with FREE delivery to any address within mainland UK! 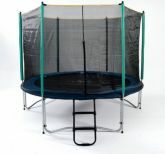 Our basic 10ft Trampoline packages come complete with a Trampoline Weather Cover and Access Ladder. The 10ft trampoline has a diameter of 10ft and measures 110” in height, and can hold up to 100kg in weight so is suitable for both children and adults. Trampoline safety is extremely important, and an Enclosure can provide complete peace of mind when children are using the Trampoline. Atlantic Trampolines stock Trampoline Enclosures in a full range of sizes, and they can be bought individually or as part of a Trampoline with Enclosure package. And if you buy one of our 10ft Trampoline with Enclosure combi packs, you will save almost £30 compared to buying of the parts separately! Atlantic Trampoline’s 10ft Trampoline ultimate deal is a 7-piece Ultimate Deal package containing everything you need to get started with Trampolining – from the safety essentials, to a fun Trampoline Tent and Shoe Bag! They are perfect for those who are new to Trampolining and buy buying all the parts in one package you will save over £65 compared to buying all the parts separately! At Atlantic Trampolines, we believe that Trampolining should be fun but that safety should always come first. So you can feel confident that you are buying a 10ft Trampoline of the highest quality and safety standards when you buy from Atlantic Trampolines.